Sydney rubs its sleepy eyes, stretches its weary limbs, and dusts off the residue of the working week, and when it climbs out of bed this weekend it will be going to market, to market with a sparkle in its eye! The spirit of community, creativity and curiosity can be found in the heart of the inner west amongst its charismatic markets. For the early risers the Leichhardt Organic Farmers Markets (Corner of Perry Street and Balmain Road) is a small but charming space that is open at 8am and finishes at 1pm on Saturdays. Pass by with the lure of coffee and blueberry bagels to get the motor running or perhaps a freshly squeezed juice to cleanse the system; the school gates extend their welcome into the land of the living. Produce presented in a colourful array burst with the promise of vitality, flowers smile elegantly, wine and oils hint of dinner parties to come and the selection of breads, dairy and meats wink invitingly as you stroll past friendly stall holders. The simplest of ingredients to a Saturday morning ignite a yearning for a slower, more relaxed pace, a desire to connect with loved ones and to embrace the essence of the moment. What the Farmers Markets may lack the Rozelle Markets give in abundance. With approximately 100 stalls open Saturday and Sunday from 9-4pm on Darling St, weaving throughout the historical grounds of the Rozelle Public School the eye darts through a sea of the eclectic; plants, antiques, furniture, books, bags, hats, scarves, sunglasses, toys, jewellery, massages, food,clothing and other surprises. 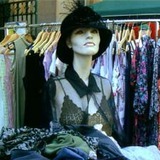 One man's trash is another mans treasure, though I would say that there is more treasure than trash to be found here, it is a bargain shoppers dream with countless stalls brimming and swelling with discarded designer brands in reasonable condition. I spoke with stallholders who had simply grown tired of their collections or needed to sell their clothes quickly before moving to Europe. The lovely ladies European holiday has now funded my winter wardrobe, the highlight of which was a pair of new Tsubi and Lee Jeans for fewer than ten dollars. Live music plays at both the front and back areas of the school, adding a relaxing and inspired soundtrack to the bargain hunter's rummage. Food and coffee are on offer next to the shade of a beautiful tree, where people have found refuge and read the paper, tap their feet, play with their dogs, share gozleme with hungry children and swap shopping for people watching. On the way back to the car, an old wooden crate caught my eye; it had the words "Flower box" written in white across the front. I did not enter the markets with this specific purchase in mind, but the market air affected me and within minutes I was proudly carrying my treasure back to my car and mentally listing a dozen creative and innovative uses for an old wooden crate! Why? Immerse yourself in community living, relax at a slower pace, nab a bargain, enjoy live music, fresh food and beverages, be inspired! Cost: Lots of bargains to be found! !